Malaysia broadband providers can be categorized into 2 categories - Fixed Broadband and Mobile Broadband. Fixed broadband are mainly used for home or business whilst mobile broadband allows for mobility. Fixed broadband are more stable considering it runs on fibre or cable. Mobile broadband, on the other hand, are not as stable due to the technology used but it gives users the flexibility to access internet from anywhere. The main fixed broadband providers in Malaysia are Telekom Malaysia (Streamyx and Unifi) and Maxis. 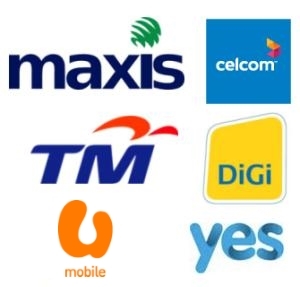 Major mobile broadband providers are Celcom, Maxis, Digi, U Mobile and YTL. Celcom holds the biggest share of the mobile broadband services in Malaysia. Celcom has the most extensive coverage across the nation. Their plans are both volume based and speed based with packages starting at 1GB with speed of 384 kbps only. For the heavier internet users, they have plans with higher volume and faster speed. Celcom also offers daily and weekly unlimited packages but both are offered at the low speed of 384 kbps. Maxis has coverage nationwide including East Malaysia. Maxis offers volume based packages of 1.5GB, 3GB, 6GB and 12GB which are designed to allow users to only pay for what they need. All the packages comes with uncapped download speed of up to 7.2Mbps. Maxis offers free modem with a 6 month contract or one can pay RM100 without a contract. Existing Maxis mobile subscribers can sign up for the broadband plans at cheaper rates. Maxis also offers data plan for iPads and laptop bundled packages. Maxis's daily and weekly plans are volume based but with uncapped speed. Digi's broadband coverage are more limited compared to Celcom and Maxis. Their broadband packages are both volume and speed based. For certain packages, the speed is even different depending on the time of access. Digi also offers prepaid internet, preloaded with 5 days internet access at download speeds of up to 384kbps. YES from YTL, is the newest entrant to the broadband market in Malaysia. Running on the 4G network, it claims to be 3 to 5 times faster than 3G. Using the prefix 018, YES, also offers voice calls on the mobile broadband network. The packages offered are based on per use basis and the rates get cheaper the more you use. There is however, a minimum monthly usage that one has to commit to. Their devices are separately priced. U Mobile is another player in the mobile broadband market. They offer USB and MiFi with a speed of up to 42Mbps. This telco is the latest to join the mobile market. There are a few packages that you can look at that may be suitable for your needs. See also the details of the main 3 players that provide mobile services in Malaysia. Streamyx, offered by Telekom Malaysia (TM) is a cable based broadband service mainly for home use. The packages offered are usage (hours) and speed based up to 4Mbps. Streamyx service, however, are occasionally disrupted during or after a thunderstorm. Unifi, Telekom Malaysia's high-speed broadband (HSBB) service, launched in March 2010, is now available in more than 750,000 homes in 48 areas nationwide. It targets to achieve 1.3 million premises passed by end 2012 at the conclusion of its first phase of HSBB roll-out. UniFi is suitable for both homes and businesses as the service delivers a faster, richer and more reliable online experience with speed up to 20Mbps. TM currently offers triple-play service (phone, high-speed broadband and IPTV) to residential areas and double-play service to businesses. Maxis also offers wired broadband service in addition to wireless broadband. Maxis is currently rolling out high-speed broadband (HSBB) service via it's own build in selected areas. In addition to that, Maxis has also signed a 10-year agreement for TM to provide HSBB (access) services to Maxis. This enables Maxis to reach more than 750,000 homes at current count and 1.3m homes by end 2012 as well. In choosing the best Malaysia broadband provider, one should look at the coverage, and of course the best plans available. Volume and speed may also be a concern, especially for those who does a lot of downloads. Many of the cheaper mobile broadband packages offers a lower speed except for packages from Maxis and YTL which do not have any speed cap.